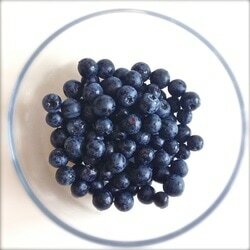 Blueberries have one of the highest antioxidant capacities. These antioxidants include many different types of anthocyanins, the colorful pigments that give many foods their wonderful shades of blue, purple, and red. Antioxidants are essential for optimizing health by fighting disease and helping to combat the free radicals that can damage cellular structures as well as DNA. A study in the American Journal of Clinical Nutrition showed that anthocyanins — the blue, purple and red pigments found in blueberries — offer protection against hypertension. Anthocyanins have also been linked to an increase in neuronal signalling in brain centres. "Blueberries are amongst the most commonly consumed berries in the United States. 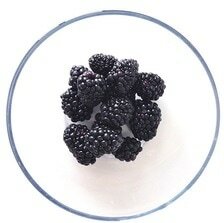 Berries in general are rich in phenolic compounds, which are known for their high antioxidant capacity." Packed with vitamins, minerals, bioflavonoids, dietary fiber & antioxidants (antioxidants are potential health benefits against cancer, aging, & inflammation). Berries in general are considered low in terms of their glycemic index (GI). GI is a way of identifying the potential impact of a food on our blood sugar level once we've consumed and digested it. "Fruit is an important part of a healthy diet. In fact, diets high in fruit are associated with all sorts of health benefits, including a decreased risk of many diseases. However, some people are concerned with the sugar content of fruit and worry that eating too much of it may be harmful. So how many servings of fruit should you eat each day to be healthy? And is it possible to eat too much? This article explores the current research on the topic." "Most guidelines recommend eating a diet with a high intake of fiber-rich food, including fruit, because they’re so healthy—antioxidants, anti-inflammatory, improving artery function, and reducing cancer risk. However, some health professionals have concerns about the sugar content of fruit and therefore recommend restricting the fruit intake. So let’s put it to the test!" "Does the threshold for toxicity of fructose apply to fruit or just to added industrial sugars such as sucrose and high fructose corn syrup?" "Does the fructose naturally found in fruit and fruit juice have the same adverse effects as excess “industrial fructose” (table sugar and high fructose corn syrup) and if not, why not?" "Fruit and vegetable intakes were associated with reduced risk of cardiovascular disease, cancer and all-cause mortality. These results support public health recommendations to increase fruit and vegetable intake for the prevention of cardiovascular disease, cancer, and premature mortality." "Much of the marketing that is used to sell dietary supplements comes from the logic that if something has a favorable effect on your health, then it's base components must be the reason behind it all. Say for example, scientists and doctors notice that green and yellow vegetables help decrease your risk of cancer. And it just so happens that these same green and yellow vegetables also have high levels of beta-carotene. Does this mean that beta-carotene is the magic ingredient responsible for lowering your risk of cancer? Not necessarily."